Created by world-renowned custom motorcycle builder Billy Lane, BLOOD, SWEAT, & GEARS is the tour that hit bike rallies across the country with live, in your face fabrication! 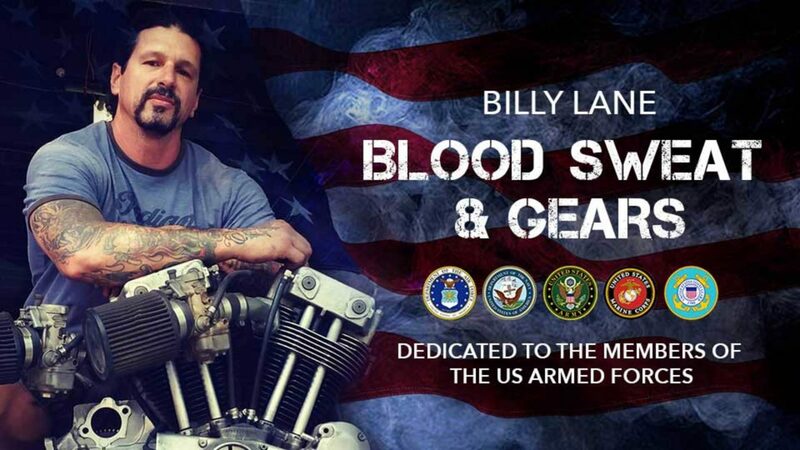 Dedicated to the members of the US Armed Forces, Billy and his master builder colleagues upgraded, modified, and tricked out custom choppers in front of tens of thousands of motorcycle enthusiasts. Proving once again to be a true innovator in the chopper world, Billy and crew turned a 53ft flatbed trailer into a complete fabrication shop on wheels. They pulled into town, raised the roof, and performed custom fabrication feats for die-hard fans, who braved both rain and heat at six major bike rallies nationwide. This is an all-access pass to a piece of motorcycle history!